just wanted to get some opinions. To me it sounds like you are describing an Edge 2.0 jersey. If that is the case, I would think it is a game worn as opposed to a warmup. It also could be a retail authentic. From what I've seen the AHL actually has retailed Edge 2.0s. But since its a warmup jersey does it look different than what the crunch would normally wear? Also I thought historically warm-up jerseys didn't have player names on them. Then again I could be wrong - I'm basing this off old warm-ups worn by the KY Thoroughblades in the AHL that just had a number. it looks just like what they would wear, it does indeed feel like ccm material and isnt stretchy like the edge's. It has full name and number in two layer tackle twill as long as all the rbk logos and the ahl patch. The fight strap as well, the only thing ive never seen is that it has a jock tag that has the size 56 indicated on it. Brent Regner isnt a huge name AHL player so i was assuming this was game issued, it has to be. The guy i bought it from for 55 dollars didnt even know what a rbk edge was. I asked is this an rbk edge jersey and he said no its rbk haha. For 55 dollars you cant beat it but it bugs me i dont know what it is. If it has a jock tag its most likely a retail authentic. We won't know until you post pictures though. AHL retail authentics do not have jock tags. Premier jerseys do not, either. Since he played for the team in 09/10 does it have the P&C patch on the front over the right side? Does it have the Blue Jackets logo patch on one of the shoulders? AHL authentic jerseys DO NOT have jock tags, nor do AHL replica Premiers. The authentics sold at retail comes from the same run as the game issued jerseys for the AHL. If that Crunch jersey does not have a BlueJackets patch on the shoulder, which all their authenic and replicas have, then it is a practice jersey. AHL practice jerseys do come with jock tags, although sometimes they get removed by the team/players. How do I know this, I watched an AHL practice this week in person. Also, I own 9 AHL authentic Edge jerseys. I learned something interesting inadvertently from this thread that's also comical. I'd never heard of Brent Regner and when looking him up online I found out Chinese knockoff jersey makers are really stepping up their support for the Columbus Blue Jackets. One site had fake Columbus Brent Regner, Tom Sestito, Jonathan Siglet, & David Savard jerseys. They are now making fakes of guys who haven't even made it out of the AHL or have only played 3-4 NHL games! Wow, so not only is no team safe, it would now appear that no player is safe. So be on the lookout for those fake Cody McCormick Avalanche jerseys. I'm sure some people will start listing them as rare Brent Regner jerseys. And have catchy sentences like: "You just can't find these!!!" Haha thanks for all the input guys, im telling ya based on all the jerseys i have..ahl and nhl it looks like a warm up jersey, i used to go to the phantoms games all the time before they moved to adirondack and some of the opposing teams would wear warm up jerseys in the pre game skate, they looked more so like a practice jersey then the actual edge jersey so im keeping my assumption that this is a warm up/practice type of jersey. No way is it fake though, no one would be able to make a knock off of this quality. It's not a game jersey, that tag gives it away as a practice jersey, but the striping and the nameplate don't make sense. 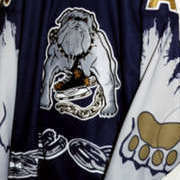 It could be a warm-up jersey, but usually they are plastered with at least one sponsor patch. If there are any Crunch fans, maybe they can better place this. Whatever it is, it's unique and a great buy for what you paid. Cool pickup. Absolutely. It's a legitimate jersey, I just don't know exactly how and where it was used. but because of the name and number being on it and not being a more publicized popular player do you think its possible to have once belonged to regner? coulda been used in like a training camp game in front of a crowd or something.. ? ?